To accompany this report, we have created an online interactive tool that allows you to look more closely at individual districts and the impact of wealth on education spending. Due to a range of factors, notably an increasing proportion of high-needs special education students, the foundation budget significantly understates the true cost of staffing in-district SPED programs and paying tuitions for specialized out-of-district placements. Similarly, original design of the foundation budget did not foresee the dramatic increase in health insurance costs nationwide, and the general inflation factor identified for adjustments to the foundation budget has lagged well behind true cost growth in this area. The original foundation budget targeted additional resources to address the greater needs of low-income students in two very direct ways: 1) providing funding for 3 extra teachers for every 100 low-income students; and 2) allocating $380 (in FY 1993 dollars) per low-income student in expanded program allotment money to help schools expand instructional time for these targeted students. While this incremental money still exists in the low-income student enrollment category of the foundation budget, there is little evidence that low-income students are receiving this additional instructional support. Spending on Regular Education Teachers is well below foundation for the lowest-wealth districts, and total spending on Regular Education Teachers is significantly greater for the highest-wealth districts. Due in large part to increased health insurance and special education spending needs, most districts, not just the lowest-wealth districts, spend below foundation on Regular Education Teachers. Only the highest-wealth districts spend at foundation in this category. 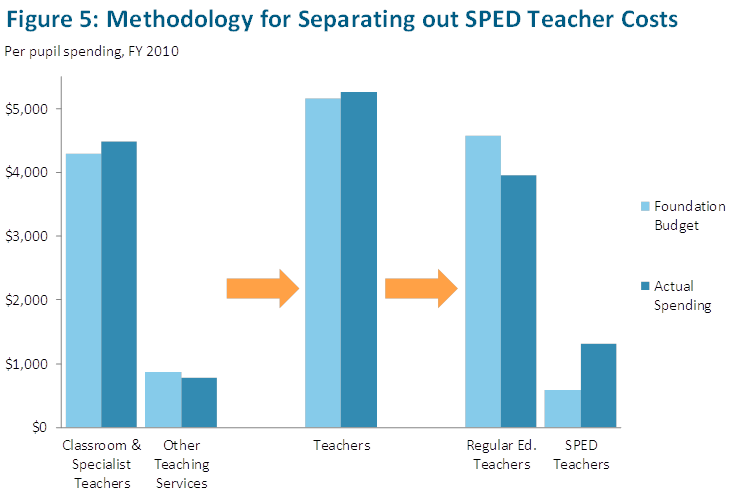 This distinction between under-spending on Regular Education Teachers and over-spending the foundation budget consideration on SPED Teachers is masked in analyses that combine these two types of teacher spending together. Furthermore, teacher salaries, adjusted for inflation, have remained remarkably level with the foundation budget's original salary assumption. This means that teacher spending below foundation levels has likely been manifest in the form of fewer total teachers than foundation calls for, resulting in larger class sizes, less planning and meeting time for teachers during the school day, and the hiring of fewer specialist teachers, such as literacy specialists, language teachers, art teachers, etc. Due to issues with implementation of inflation adjustments over time, the full foundation budget has lagged behind true cost growth since FY 1993. This lagging in value helps explain a portion of the foundation budget's understatement of actual district spending. Every school district should have an adequate level of school funding, based on the specific size and needs of its student population. Concurrent with legislative reform efforts was litigation of McDuffy v. Secretary of the Executive Office of Education, a high-profile State Supreme Judicial Court case filed by a group of students from communities with low property values arguing that the state was not living up to its obligation to provide an adequate education for all. The court found on behalf of the student plaintiffs and the school finance provisions within the Education Reform Act of 1993 served as the Legislature's remedy, designed to advance greater funding adequacy and equity. The focus of this paper is on the foundation budget referenced above. By comparing actual spending to the foundation budget for Massachusetts school districts in Fiscal Year (FY) 2010, we find that the real value of the original foundation budget has eroded significantly over time, due in large part to rapid cost growth for health care and special education. Since the foundation budget's original design did not foresee this rapid cost growth, spending reductions have been forced in other key areas, especially Regular Education Teachers. We also find that due to implementation issues with inflation adjustments, the real value of the foundation budget lags behind the original dollar amounts written into state law in FY 1993. In July of 1991, the Massachusetts Business Alliance for Education (MBAE) released Every Child a Winner! : A Proposal for a Legislative Action Plan for Systemic Reform of Massachusetts' Public Primary and Secondary Education System , an influential report that helped frame the reform approach advanced by the Education Reform Act of 1993.2 In the appendix of this report was a school finance reform proposal that included a detailed "foundation budget," a calculation of precisely how much funding was needed to provide an adequate education in Massachusetts schools. Shortly thereafter, the Legislature convened a school finance working group to craft its own foundation budget in order to calculate precisely the total cost of providing an adequate education for all students in every district for a given year. The Legislature's working group included authors of Every Child a Winner and ultimately designed a final foundation budget that was very similar to the one articulated in Every Child a Winner; in many cases, the final foundation budget mirrored proposals from the appendix of Every Child a Winner down to the specific dollar amount. Using a uniform set of parameters, foundation budgets are calculated individually for each of the Commonwealth's 328 school districts, and they are fully recalculated prior to every new school year in order account for changing demographics, enrollment levels, cost increases, and regional wage levels. Following is a description of the main components of a district's foundation budget for a given year. For more detail, please see the Department of Elementary and Secondary Education's document The Massachusetts Foundation Budget, available HERE. Please see the Table II in the Appendix for a detailed list of changes made to the foundation budget since 1993. Foundation budget cost allocations are made on a per pupil basis, since funding should be proportional to the number of students educated. The foundation budget assumes that high school students cost more to educate than elementary school students, and it assumes that elementary school students cost more than middle schoolers. This variation across grade levels is driven mostly by different class size assumptionsclass sizes of 17 for high school, 22 for elementary, and 25 for middle school. High schools typically have the smallest class sizes due to the need for more specialized class offerings. Elementary schools typically have smaller class sizes than middle schools due to the greater attention needs of younger children. The foundation budget reflects the additional resource needs of vocational schools through greater allocations in a separate base enrollment category. Higher associated costs result from smaller assumed class sizes and greater materials and equipment costs. In FY 2010, the rate for a regular education vocational student was $12,307, 52 percent higher than the per pupil high school rate of $8,071. Similarly, the formula acknowledges higher costs associated with educating English Language Learner (ELL) students through a separate base enrollment category. Originally, transitional bilingual classes were assumed to have smaller class sizes, thus requiring additional funding, but with the end of permanent bilingual education in Massachusetts, these additional costs have been shifted towards all students identified as ELL. The foundation budget also recognizes that low-income students and special education students have higher associated educational costs, and these are calculated as incremental costs on top of amounts calculated for individual students in base enrollment categories. "Despite their problems, the superintendent of Holyoke's schools told us that his schools offered many of his students the best few hours of their days. Given the problems these youngsters face at home, he placed high priority on extended day programs for disadvantaged youngsters. Similarly, any progress the schools were able to make during the academic year could be lost during the summer. Students from more affluent families, it was felt, often had their formal public school educations supplemented by countless informal educational opportunities that were less often enjoyed by low-income students. Directly providing resources to extend learning time for low-income students beyond the typical 6 hour a day, 180 day a year school calendar was seen as an important strategy for helping close persistent achievement gaps. Every Child a Winner actually sought to provide supplemental resources for low-income students in two additional ways: 1) by funding free half-day preschool and full-day kindergarten for all low-income children in the state; and 2) by increasing the pay of teachers in predominantly low-income schools. These additional resources did not make it into the final foundation budget, however. These supplemental low-income funding sources have since been consolidated, and in per pupil terms, low-income students received an additional $3,239 at the elementary level and $2,619 for junior high and high school in FY 2010. Students associated with the highest costs within the foundation budget are those in special education (SPED), either those being educated within the school district or ones with greater needs for whom the district pays tuition to specialized private schools. Unlike with other enrollment categories where the formula takes a specific headcount of individual enrolled students, for SPED calculations the formula multiplies assumed SPED percentages by total enrollment numbers. The formula does this in order to discourage districts from over-identifying SPED students in the hopes of receiving additional funding. Currently, the foundation budget assumes that 3.75% of students will receive SPED services in-district, 4.75% of vocational students will receive SPED services in-district, and 1% of students will have the greatest SPED needs and will be tuitioned-out. In FY 2010, the incremental foundation rate was $23,618 for every assumed in-district SPED student (in full-time equivalent terms) and $24,671 per assumed tuitioned-out student. Since they are expressed in full-time equivalent terms, the SPED assumed percentages are not quite as low as they may seem at first glance; twenty percent of a district's students may receive some level of SPED services, but most of these students spend the majority of their instructional time in regular education classes, with Individualized Education Plans (IEPs) directing them to receive specialized services for a small number of class periods per week. It is important to note that for some types of higher-cost students, supplemental dollar amounts are already included in the base calculation, whereas for others the supplemental dollars come through an additional incremental enrollment category calculation. ELL students costs, for example, all flow through base enrollment categories (enrollment categories 7-9 in Table I of the Appendix), whereas SPED and low-income students costs are obtained by summing a base enrollment amount (categories 1-10) with an incremental enrollment amount (categories 11-14). 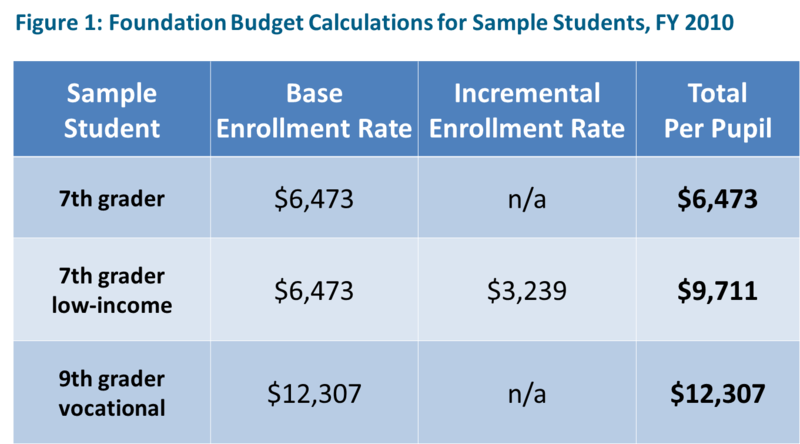 Figure 1 shows how the base and incremental enrollment rates work for three sample students. For each type of student described above there are associated educational costs, each given a specific per pupil dollar amount within the formula. The relative size of each cost allocation is based on the educational judgment of those involved in designing the original foundation budget. Classroom and specialist teacher costs are higher at the high school level, for example, based on the smaller class size assumption discussed earlier, not because high school teachers are paid more. Additionally, guidance and psychological costs are higher at the high school level due to greater career, college, and psychological support needs among high school students. In order to determine a district's foundation budget, these dollar amounts are multiplied by the number of students in a given enrollment category. Table I in the Appendix shows the FY 2010 per pupil foundation budget rates. Across the horizontal axis are the eleven education cost categories,3 and down the vertical axis are the different enrollment categories. Each student counts once towards one of the first ten base enrollment categories, while low-income and SPED students receive additional funding through one of four incremental enrollment categories. Once preliminary foundation budgets have been determined, the law makes an adjustment for districts situated within regions of the state that have higher wages than the state average; districts in areas with higher wages must spend more money to hire the same number of qualified teachers and staff. The wage adjustment is applied only to the salary-related cost categories within the foundation budget, not to instructional equipment, employee benefits, or special education tuition. Since foundation budget dollar amounts were articulated in FY 1993, the Chapter 70 law identifies each dollar amount written into law as a base amount to be adjusted annually by inflation. The law, for example, instructs that the original $38,000 teacher salary assumption get adjusted for inflation every year. Specifically, the law instructs the Legislature to use the Implicit Price Deflator for State and Local Government, a price deflator that tracks prices of things typically purchased by state and local governments. For a discussion of ways in which the foundation budget has not fully kept pace with actual costs see the section Issues with Inflation Calculations since Fiscal Year 1993 later in this paper. 3Eighteen original cost categories were consolidated and restructured down to eleven in FY 2007. 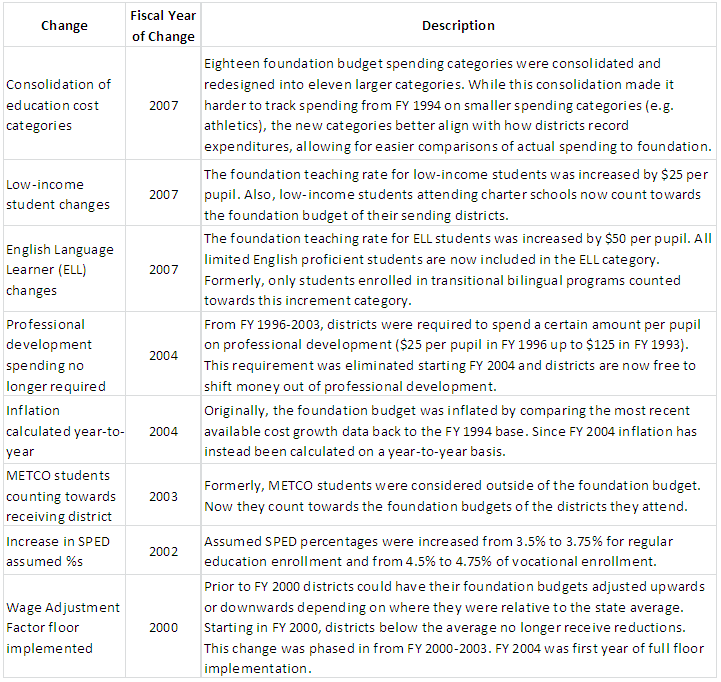 Please read further for more detailed discussion of changes to the foundation budget since FY 1993. Our analysis of general fund spending does build in federal State Fiscal Stabilization Fund (SFSF) revenue because this money was distributed to districts through the Chapter 70 formula and was used to help ensure that no districts fell below foundation levels. Statewide totals give a general sense of how much districts are spending above foundation, but they tend to mask stark differences across different types of districts. While statewide general fund spending is 16 percent above foundation, there is wide variation across the wealth spectrum. One-third of students attend districts spending essentially at foundation, whereas 28 percent of students attend districts spending 21 percent or more above foundation. Since Chapter 70 state aid is essentially determined by filling the gap between a district's foundation budget and the community's minimum required local contribution, communities that do not spend above their required minimums end up spending right at foundation levels. This means that for those communities spending right at their required minimums--predominantly lower-wealth communities--upwards adjustments to foundation will lead most directly to increased total spending levels because state aid and local contributions will have to rise to meet new baseline foundation amounts. Another way to identify the range of actual spending for different types of districts in Massachusetts is to group districts by the relative wealth of cities and towns that fund their local contributions. 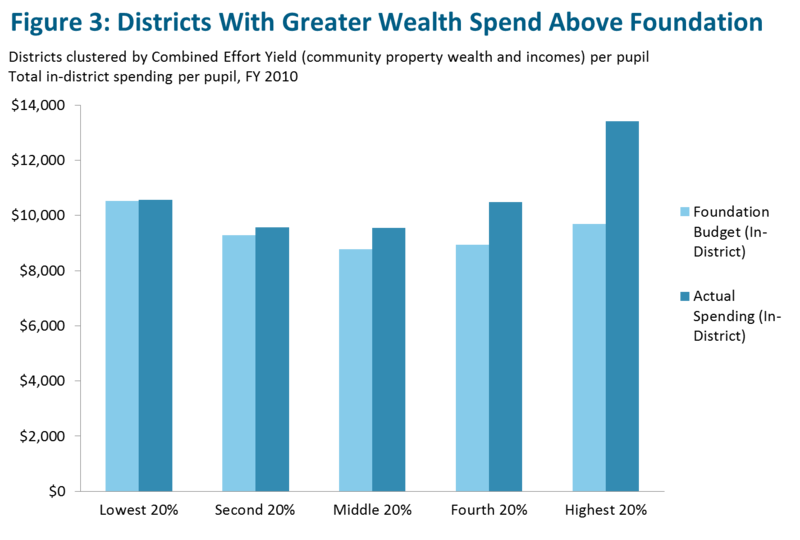 Figure 3 clusters all Massachusetts districts into five wealth quintiles, identifying respective gaps between foundation and actual spending.5 Here the pattern is quite consistent, with districts spending over foundation by increasing amounts as you move from the lower to higher wealth quintiles. The least wealthy 20 percent of districts have average spending right at their average foundation budget, whereas the wealthiest 20 percent of districts spend 39 percent above foundation. These findings indicate that communities with greater wealth make it a priority to raise additional local revenue to fund education at levels significantly above baseline foundation amounts. 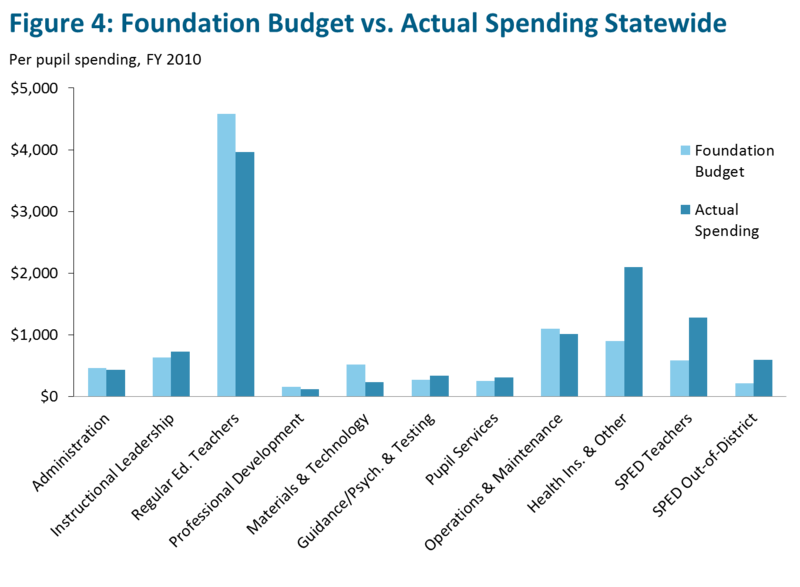 Figure 4 compares statewide actual spending to foundation budget allocations across each of the education cost categories, showing that the foundation budget significantly understates district costs for Health Insurance & Other, SPED Teachers, and SPED Out-of-District. Conversely, we observe districts spending significantly under foundation on Regular Education Teachers. The contrast between districts spending above foundation on SPED Teachers and below foundation on Regular Education Teachers gets lost in analyses that combine these two categories of teaching together (see Methodological Note below). Since Department of Elementary and Secondary Education (DESE) reporting of actual special education (SPED) spending lumps together spending for two separate teaching categoriesClassroom & Specialist Teachers and we lump them together on the foundation side as well. Re-clustering smaller subcategories into two new onesRegular Education Teachers and SPED Teachersallows us to conduct separate analyses of spending on regular education teacher costs and special education teacher costs in a way that has not been done in prior foundation budget analyses. SPED costs are built into most of DESE's eleven cost designations along with regular education costs. A portion of the total $518 per pupil designated for Materials & Technology, for example, comes from the dollar increment for SPED students. 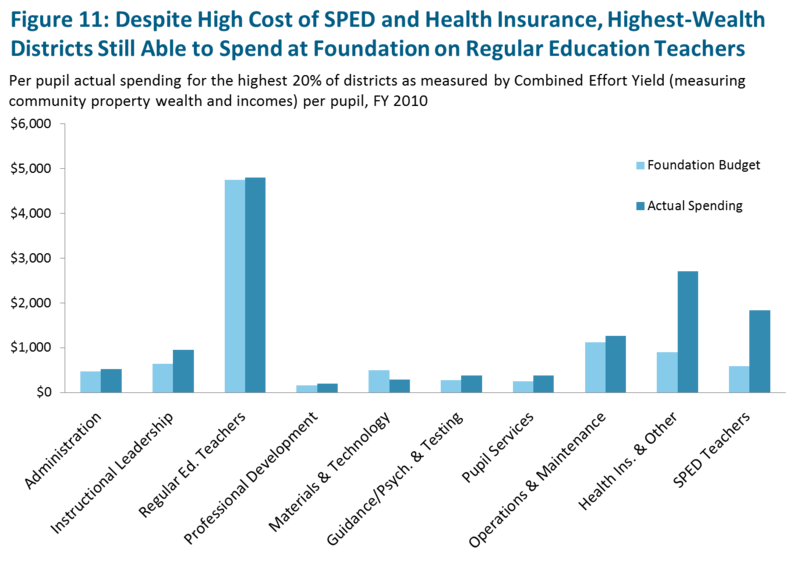 Ideally, we would be also able to separate out these costs on both the foundation and actual spending sides in order to run separate comparisons for SPED and regular education services, but this is not possible across the board since districts identify specific SPED expenditures only within some cost categories and lump them in with regular education costs for others. 4Core analyses of current foundation to actual spending use data for FY 2010, since this is the most recent year for which we have complete district-level spending amounts. 5Wealth quintiles in this paper cluster districts using DESE's Combined Effort Yield, a combined measure of municipal property and income wealth, and dividing this by the number of students attending a given district. For regional districts Combined Effort Yield is allocated proportionally by the number of students coming from a given municipality. 6In order to shorten and/or clarify the major spending components of the eleven DESE foundation categories, we have also changed titles of the following: "Instructional Materials, Equipment and Technology" to "Materials & Technology"; "Guidance, Counseling and Testing" to "Guidance/Psych & Testing"; "Insurance, Retirement Programs and Other" to "Health Ins. & Other"; and "Payments to Out-of-District Schools" to "SPED Out-of-District." 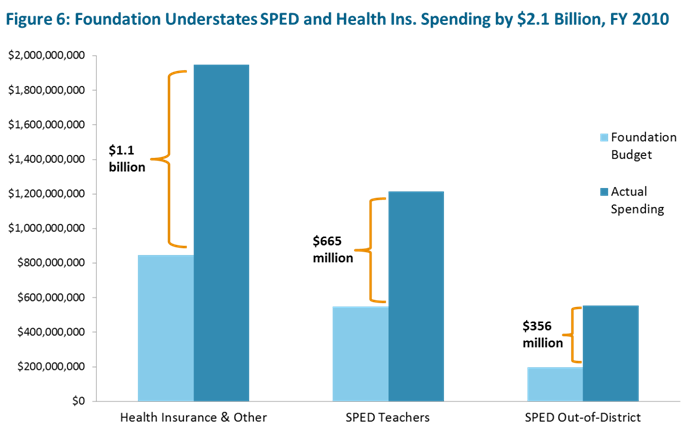 Health Insurance & Other, SPED Teachers, and SPED Out-of-District are the three cost categories where the foundation budget is furthest below actual spending. Figure 6 shows that when taken together the foundation budget understates district spending on core SPED and health insurance spending by roughly $2.1 billion. The foundation budget allocation for Health Insurance & Other has not kept pace with the actual costs to districts of contributing to health insurance for school employees.8 This is primarily because health insurance costs nationwide have increased at a significantly higher rate than the rate of inflation used to adjust the foundation budget. In addition, school districts have had less ability to hold down cost growth by shifting health care costs to employees (through increasing co-pays and deductibles) than other employers have had. Recent legislation has made it easier for local governments to shift health care costs to employees, and that will likely reduce the rate of health care cost growth for schools. But while the gap between what the foundation budget allocates for health care and what health care actually costs may not grow as rapidly in the future as it has in the past, the existing gap will likely remain until the foundation budget is adjusted to reflect current costs. Also contributing to this gap, albeit in a smaller way, are the other technical inflation-related issues described later in the section Issues with Inflation Calculations since Fiscal Year 1993. Not inflating cost amounts for the first year of implementation in FY 1994, skipping a high-inflation quarter in calculating the FY 2010 budget, and not capturing the full value of backwards adjustments to the inflation measure have had the combined effect of leading to artificially low foundation levels across the board. Additionally, the foundation budget understates core special education costsfor in-district SPED teachers and out-of-district SPED tuition payments to specialized private schoolsby about $1.0 billion. 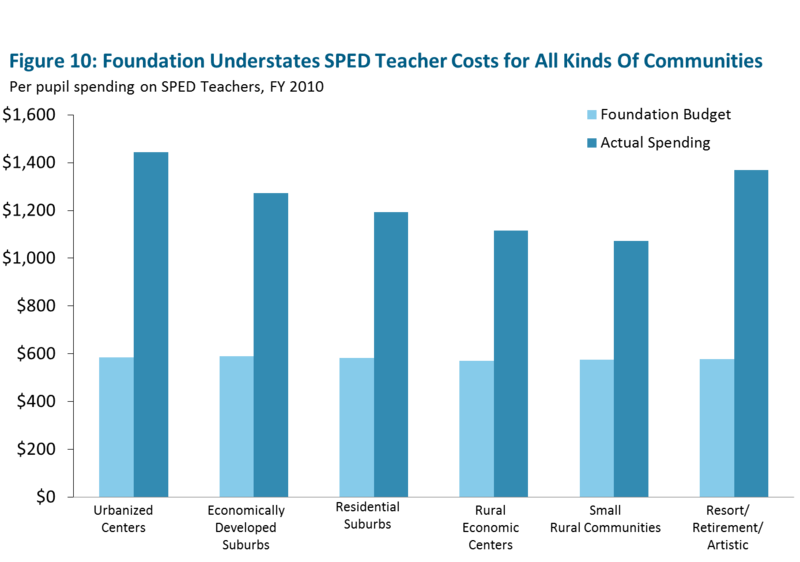 While this comparison captures the majority of SPED costs, it is likely a somewhat conservative estimate of the actual gap between full foundation for SPED and actual spending since there are additional SPED costs lumped into other categories such as Professional Development and Materials & Technology. 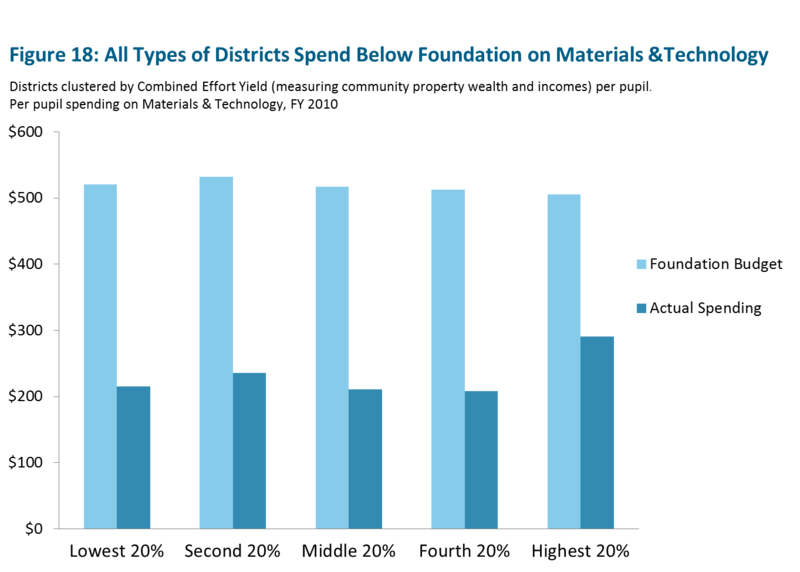 The true extent to which SPED costs are understated by the foundation budget has mostly been masked by previous analyses due to the way in which SPED costs are spread across foundation categories. After separating them out where possible we see that the magnitude of this SPED gap is actually quite similar to that of the health benefits gap. Rates of children with special needs have grown most rapidly for children 0-3 years old, suggesting that the population of SPED students with severe needs will continue to grow in future years as these students come up through the grades. Because school districts have a legal mandate to meet the needs of students outlined in IEPs, these non-school factors have led to a greater proportion of high-needs children being serviced either through intensive in-district SPED programs or through tuition payments for severely disabled SPED students whose needs cannot be adequately served within the public school setting. These required SPED costs essentially amount to fixed costs over which districts have little discretion. 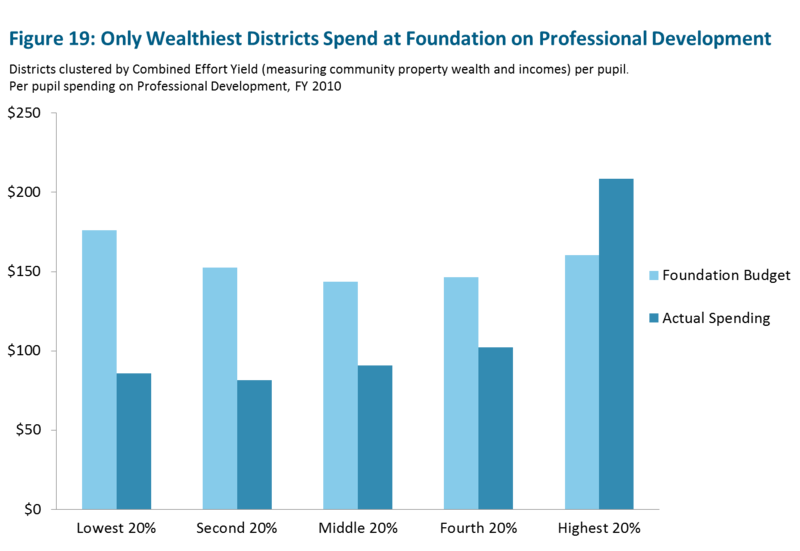 Unlike the trend we observed in Figure 3 with lower-wealth districts spending right at foundation for total in-district spending, all types of districts regardless of wealth spend significantly above foundation for employee health care and core SPED costs. Figure 7 below breaks out spending on Health Insurance & Other by wealth quintile, and we see that foundation significantly understates district costs across the wealth spectrum. The fact that everyone is spending well above foundation, even districts with the fewest financial resources, suggests that these costs are being driven largely by exogenous cost factors largely outside of local control. 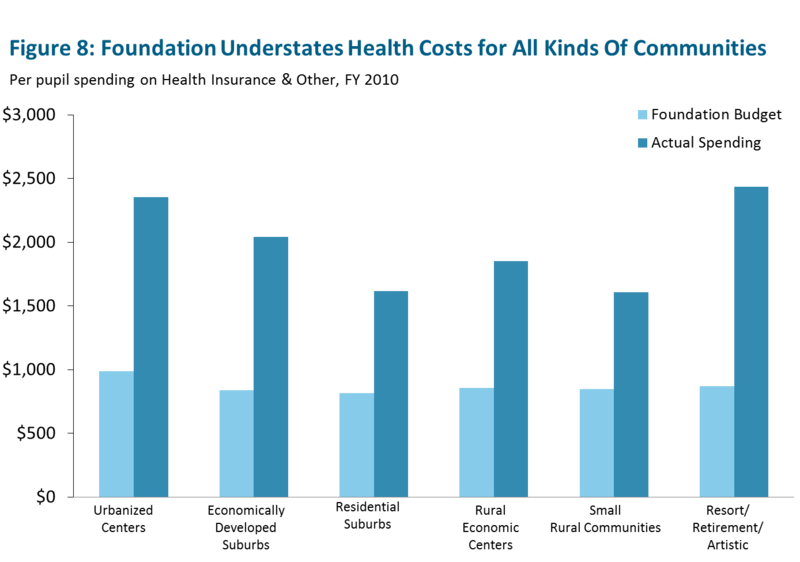 Breaking out health costs by different kinds of community (Figure 8) yields a similar pattern, with all district types spending significantly above foundation. And, again, the story is quite similar for spending on SPED Teachers, both when clustering districts by wealth and by kind of community (Figures 9 and 10). What is the effect of the foundation budget's significant underfunding of employee health insurance and SPED support on districts' abilities to spend baseline amounts on core education components, such as teachers, professional development, and instructional materials? First let's look at spending across the education cost categories for districts in the highest-wealth quintile (Figure 11). 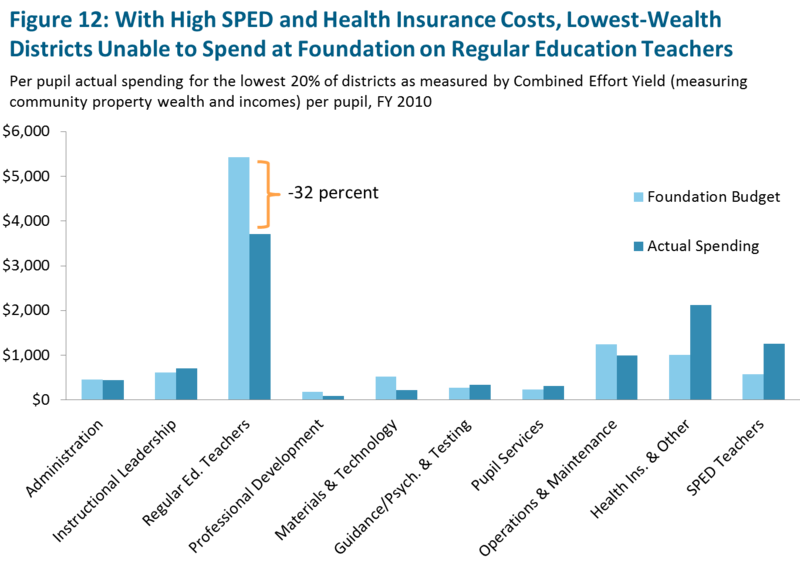 On the right-hand side of the graph we again see the large gaps between foundation and actual spending for Health Insurance & Other and SPED Teachers.12 Interestingly, however, high-wealth districts are still able to fully fund baseline foundation amounts on Regular Education Teachers, by far the highest-cost category in the foundation budget. 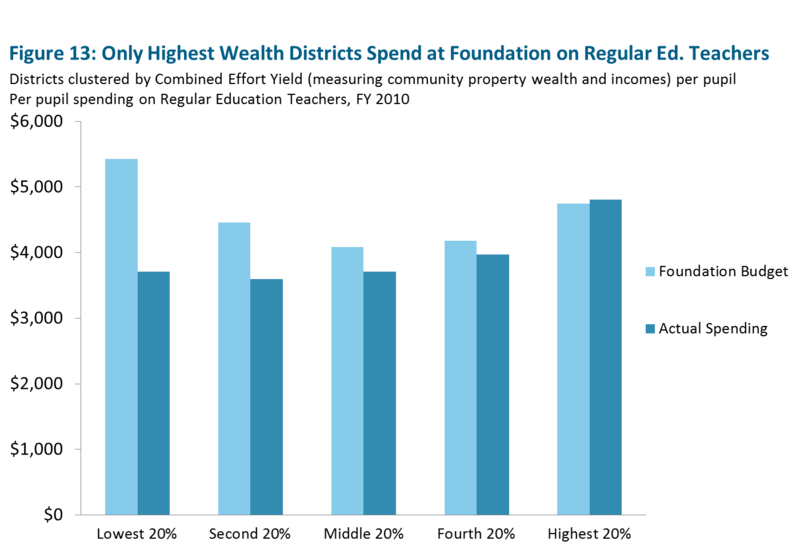 High-wealth districts are able to spend well above foundation on health insurance and SPED without significantly shortchanging other categories by raising additional local revenue and, in total, spending above foundation.13 The fact that these communities contribute more local revenue so that they can still spend roughly at foundation levels on their districts' core educational functions, signals that they value spending at levels determined by the foundation budget to be sufficient for providing an adequate public education. 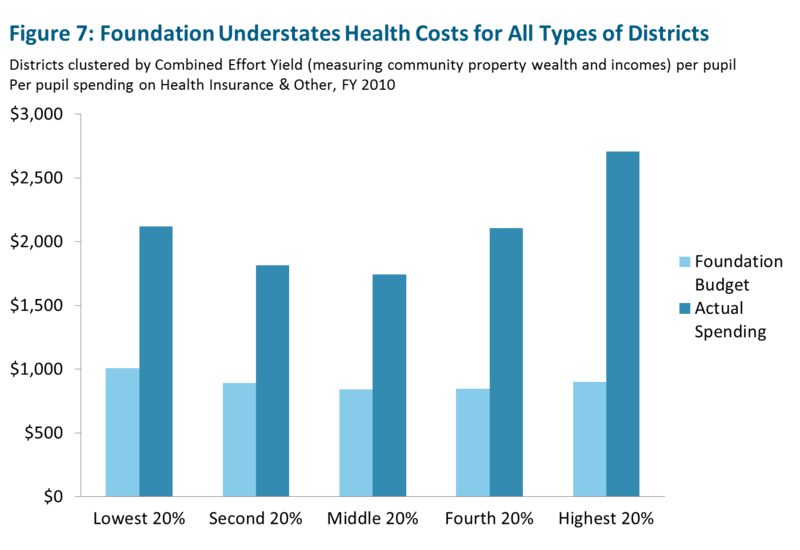 The effect of foundation not reflecting current health insurance and SPED costs looks quite different, however, for districts in the lowest-wealth quintile, as demonstrated in Figure 12 below. Here we observe low-wealth districts spending significantly above foundation on Health Insurance & Other and on SPED Teachers, but, unlike those in the high-wealth quintile, these districts spend 32 percent below foundation on Regular Education Teachers. Low-wealth districts spend below foundation on a few other, much smaller categories as well, but by far the largest single gap is for Regular Education Teachers. 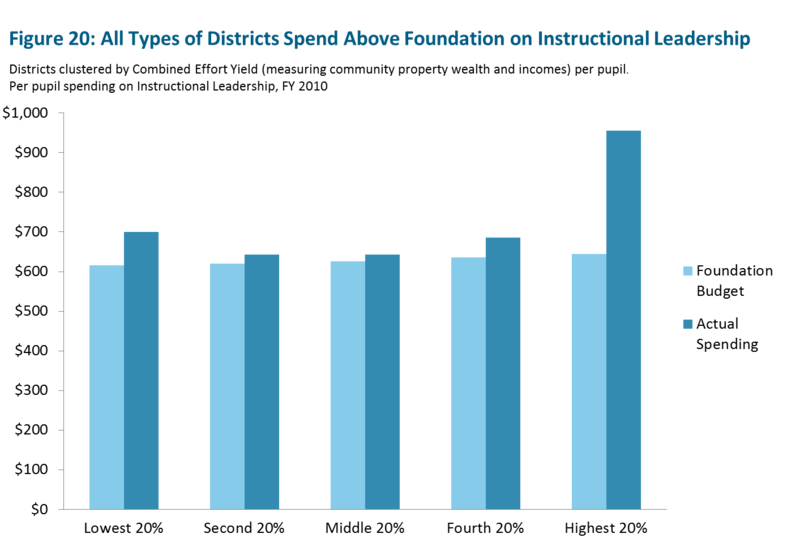 For districts whose total spending is right at foundationpredominantly lower-wealth districtsspending above foundation's assumed levels in certain categories necessarily results in spending below foundation in others. Because increased spending on employee health care and special education is driven by factors largely out of local control, districts must seek large cost reductions elsewhere, and Regular Education Teachers offers the largest spending category from which to seek these reductions. It is worth recalling that the original foundation budget was designed to provide low-income students with more teaching support than baseline levels for non-low income students, not less. The original program, written into the foundation budget, funded smaller classes for low-income students by providing funding to hire 3 additional teachers per 100 low-income students, and it funded a $380 expanded program allotment per low-income student to support expansion of learning time for these students. Unfortunately, current spending data indicates that most of this supplemental teacher funding has been consumed by cost growth in other areas of the foundation budget, greatly hampering districts' ability to direct additional instructional support for targeted student populations as part of their efforts to close persistent achievement gaps. Figure 13 below looks at spending on Regular Education Teachers across the five wealth quintiles, showing that the lower the wealth quintile, the further districts are from spending at foundation. 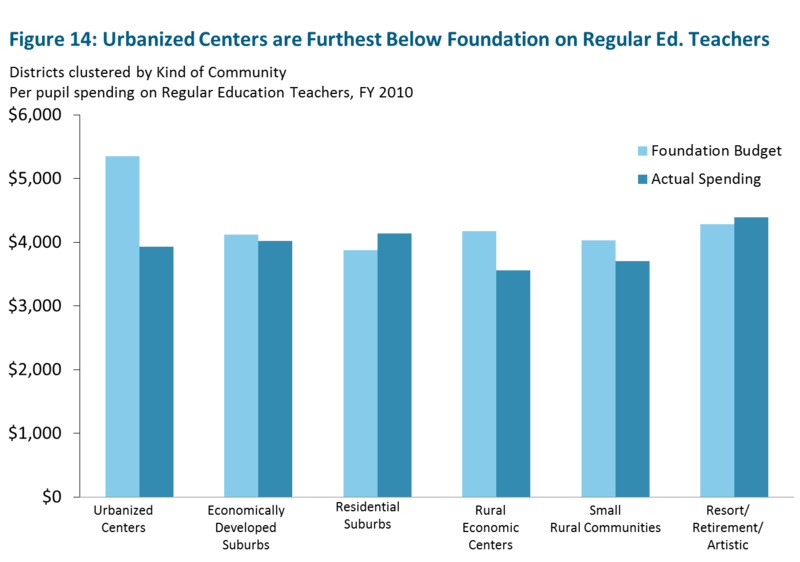 Only districts in the highest-wealth quintile spend at foundation on Regular Education Teachers. The basic trend shows that as we move across the graph from the lowest-wealth quintile on the left to the highest-wealth quintile on the right, foundation budgets for Regular Education Teachers decline while actual spending increases. This mismatch runs counter to the intent of the original foundation budget, which was designed to recognize greater needs of low-income students. And, yet, the opposite is occurring, with more affluent districts actually spending more on teachers. While actual spending in the highest-wealth quintile is significantly higher than that of every other quintile, it should be recognized that the foundation budget in this quintile is also somewhat higher than each of the three middle quintiles. Foundation for the highest-wealth quintile actually goes up because foundation is largely driven by the number of low-income students in the school system, whereas our wealth clustering of districts looks at the wealth of the whole community supporting the schools. In the case of the highest-wealth quintile, it includes a few urban communitiesnotably Cambridge, Somerville, and Bostonthat have high property and income wealth at the same time as they have relatively large proportions of low-income students enrolled in their schools. For this subset of districts, their relatively large proportions of low-income students are reflected in their higher foundation budgets, whereas their higher property and income wealth are reflected in higher required local contributions, which make up a portion of their actual spending. 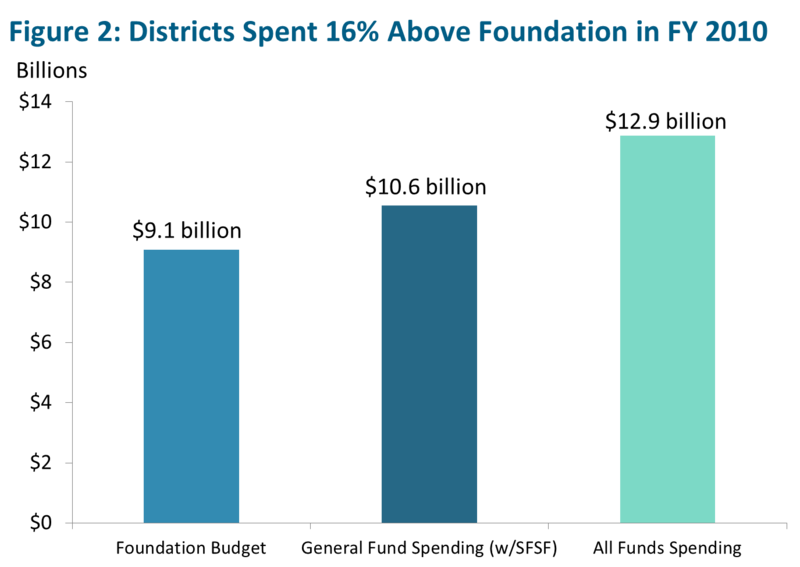 Figure 14 shows the same comparison of foundation to actual spending for regular education teacher spending, but instead breaks districts down by kind of community. Under this clustering scenario, we see that Residential Suburbs and Resort/Retirement/Artistic communities each spend a little bit above foundation. All other kinds of communities spend below foundation on Regular Education Teachers, with Urbanized Centers spending 27 percent below. 12Due to reporting issues we cannot isolate SPED Out-of-District costs by district, so they are included only when looking at state totals. Since the vast majority of districts are spending below foundation on Regular Education Teachers, Massachusetts schools have two options for spending below foundation on teachers: either reduce average teacher salaries or hire fewer teachers overall. As we will see below, teacher salaries in Massachusetts have remained closely in line with the value of the original salary assumption, so reductions are likely to be occurring in the total number of teachers hired. The original foundation budget used for creating the Education Reform act of 1993 identified $38,000 as a reasonable salary level in the base year of FY 1993. To get a sense of the value of this salary assumption today, we take this amount and inflate it to FY 2010 dollars, yielding a current foundation salary of $69,168. Due to a series of policy changes implemented over the intervening years, however, $69,168 is significantly higher than the $61,967 teacher salary assumption actually used for calculating districts' FY 2010 foundation budgets. Not inflating the original $38,000 teacher salary assumption from FY 1993 up to FY 1994 levels, when the foundation budget was first implemented. The Chapter 70 statute identifies FY 1993 as the base year for dollar values written into the formula, but the Legislature chose not to inflate these amounts to capture the 2.2% cost growth that occurred between FY 1993 and FY 1994. Combined, these inflation-related issues have eroded the value of the teacher salary assumption since FY 1993. While actual spending on salaries is roughly $6,800 higher than the salary assumption used for calculating foundation budgets in FY 2010, average teacher salaries today are actually slightly below the present value of FY 1993's $38,000 teacher salary assumption ($68,781 vs. $69,168). The Legislature felt that $38,000 was a reasonable average teacher salary in FY 1993 and this continues to look reasonable today when considered in the context of what districts are actually spending. In fact, districts are hiring a mix of teachers that is significantly more highly educated today than twenty years ago, and they are doing this by paying them roughly the same salary level, adjusted for inflation. Figure 17 relies on data from the decennial US Census, showing 28 percent increase in the proportion of Massachusetts teachers with masters degrees or higher since 1990. Since average teacher salaries have remained constant since the original salary assumption was written into the Chapter 70 law, teacher spending below foundation must manifest itself in some reduction of actual staffing levels. Reduced staffing levels below foundation assumptions could take the form of larger class sizes, less planning and meeting time for teachers during the school day, and the hiring of fewer specialist teachers, such as literacy specialists, language teachers, art teachers, etc. Data on each of these both for FY 2010 and for years going back to FY 1993 are quite difficult to track at the state level and mostly fall outside the scope of this analysis. Further research into teacher staffing trends over time in Massachusetts and across the wealth quintiles would be a useful addition to the growing conversation about the current adequacy of the foundation budget. 14Making definitive comparisons between average teacher salaries and foundation budget allocations is further complicated by DESE reporting practices that have changed over the years since FY 1994. Beginning in FY 2004, for example, the DESE average teacher salary report "was expanded to include professional teachers paid from all funding sources, including general fund appropriations, federal and state grants, and revolving and special funds." 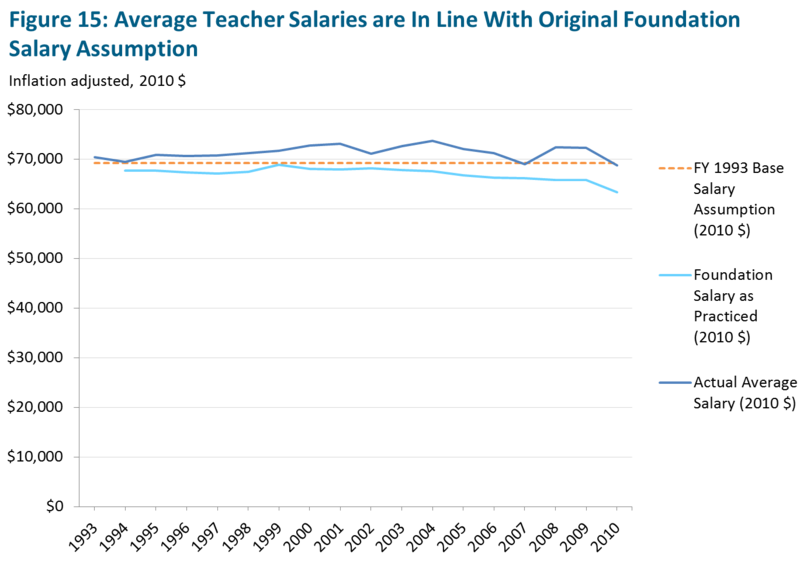 Ideally, we would have separate average teacher salary data only for teachers paid out of general funds, since that is the core of foundation budget analyses. Additionally, average teacher salaries include any stipends paid for additional duties. Materials & Technology and Professional Development are two other spending categories for which the vast majority of school districts spend well below foundation. While they are significantly smaller spending categories than the Regular Education Teachers, Health Insurance & Other, and SPED categories discussed earlier, they cover expenses directed towards the core educational experience of students and the professional experience of teachers. Figure 18 below shows that all types of districts, including the highest-wealth quintile, spend significantly below foundation on Materials & Technology, with most spending less than half of foundation. Classroom use of instructional materials and technology has clearly changed dramatically since the foundation budget was written in the early 1990s. In fact, implementation of the foundation budget coincides directly with the increasingly ubiquitous use of the internet. Today, for example, teachers have access to countless free online teaching resources that may have helped schools become less dependent upon traditional textbooks. It is hard to tell, however, if the increasing availability of computers and new internet technologies have served to increase or decrease the overall cost to schools of Materials & Technology. The fact that all types of districts are spending well below the foundation budget for Materials & Technology may signal that costs have in fact decreased; expensive, hardcover textbooks are less essential than they once were and high-powered desktop computers are cheaper than ever. On the other hand, however, it also seems plausible that districts are under-spending on Materials & Technology since foundation dramatically understates true health insurance and SPED costs, forcing districts to find savings somewhere. Not updating existing equipment and/or forgoing the purchase new technology has been one common strategy for achieving needed savings. Reduced spending on Materials & Technology may be the result of trends elsewhere in school budgets, and perhaps we are shortchanging students by not adopting wider use of computers, new science lab equipment, smart boards, etc. Again, it is hard to know whether the foundation budget overstates true professional development needs or if districts are under-spending on Professional Development because other cost drivers are forcing reductions elsewhere. The fact that the highest-wealth districts buck the trend and raise additional revenue to fund professional development suggests that spending on this category is deemed worthwhile by those districts that have the capacity to do so, but as with spending on Materials & Technology, the gap for this category likely merits further investigation. Delivery of professional development has also changed over the past several years, with a move away from one-shot teacher training days and towards investing in school-based coaches and teacher mentors who help regularize professional support and instructional improvement. Interestingly, Instructional Leadership is a related spending category for which all types of districts spend above foundation, as shown in Figure 20 below. Instructional Leadership is a much larger spending category that includes principals and curriculum directors, but it may be that districts have increasingly prioritized this type of in-school instructional support for teachers over professional development that is separated from regular classroom instruction. Analyses in the preceding sections compare actual spending to the foundation budget as it has been implemented in practice. As mentioned in the section Analysis of Average Teacher Salaries since FY 1993, there are several issues with how inflation adjustments have been made in the years since FY 1993 that have resulted in a foundation budget for FY 2010 that significantly lags behind the real cost of providing the educational program identified back in FY 1993. Failure to fully adjust the foundation budget for annual cost growth has resulted in direct cuts to Chapter 70 education aid, thereby hindering districts' abilities to implement the school program envisioned in the original foundation budget. Here, we discuss these issues in more depth. The foundation budget was written into law in FY 1993, with a commitment to distribute school aid through the new Chapter 70 formula starting in FY 1994. Deliberation over the foundation budget's specific cost allocations occurred over a couple of years preceding the law's final passage in FY 1993, and the dollar amounts settled on in FY 1993 should have been inflated to capture the 2.2% cost growth that occurred between FY 1993 and implementation in FY 1994. Since this one-year adjustment was not made, and since there has been no retroactive correction for this initial skipped year of cost growth, the foundation budget has lagged in real terms ever since its inception. In determining the FY 2010 foundation budget, the Legislature shifted forward the ratio of quarters used to calculate that year's inflation factor, effectively skipping inflation that occurred between September 30 and December 30, 2007, a high-inflation quarter. This shift resulted in an inflation rate of 3.04%, rather than a rate of 6.75%, as instructed by state law.18 This policy was adopted as part of an overall strategy for addressing the $5 billion deficit faced by the state that year, and resulted in a reduction of roughly $327 million to foundation levels statewide. Until a correction is made to reflect the actual inflation felt by Massachusetts's cities and towns during this time period, the state's foundation budget will continue to lag as a realistic measure of the cost of providing an adequate education. Originally, the foundation budget was inflated by comparing the most recent available cost growth data back to the FY 1994 base year. Since FY 2004, in an attempt to smooth volatility, inflation has instead been calculated on a year-to-year basis. Official price deflators for prior years are often revised when new data enable more accurate estimates, and year-to-year adjustments miss the opportunity to reflect these revisions over time. These revisions do not necessarily have a positive or negative bias, but the effect so far has been a slight understatement of true cost growth. The foundation budget allocation for Health Insurance & Other has not kept pace with the actual costs to districts of contributing to health insurance for school employees. As discussed earlier, this is primarily because health insurance costs nationwide have increased at a significantly higher rate than the rate of inflation used to adjust the foundation budget. Since the gap between cost growth for health insurance has been significantly greater than the more general inflation measure used for the whole foundation budget, it would make sense to inflate this part of the foundation budget using a separate measure. It could inflate the Health Insurance & Other foundation category separately using a measure of health care growth for private insurance plans, or, alternatively, it could tie growth in this foundation category to actual growth in the average Group Insurance Commission plan in Massachusetts. Without making periodic adjustments to ensure reasonable tracking between actual cost growth and inflation adjustments made to dollar amounts in the education cost categories, the value of the foundation budget has eroded significantly over time. Due to a range of factors, notably an increasing proportion of high-needs special education students, the foundation budget significantly understates the true cost of staffing in-district SPED programs and paying tuitions for specialized out-of-district placements. This paper's $1.0 billion estimate of SPED spending above foundation is somewhat conservative since it only captures SPED teacher and out-of-district tuition costs; other SPED costs embedded within Administration, Operations & Maintenance, etc. have not been separated out due to how districts report this spending. Similarly, original design of the foundation budget did not foresee a dramatic increase in health insurance costs nationwide, and the general inflation factor identified for adjustments to the foundation budget has lagged well behind true cost growth in this area. In FY 2010, the foundation budget understated health insurance costs by about $1.1 billion statewide. The original foundation budget targeted additional resources to address the greater needs of low-income students in two very direct ways: 1) providing funding for 3 extra teachers for every 100 low-income students; and 2) allocating $380 (in FY 1993 dollars) per low-income student in expanded program allotment money to help schools expand instructional time for these targeted students. While this incremental money still exists in the low-income student enrollment category of the foundation budget, there is little evidence that low-income students are receiving this additional instructional support. Spending on Regular Education Teachers is well below foundation for the lowest two wealth quintiles, and total spending on Regular Education Teachers is significantly greater in higher-wealth quintiles. Due in large part to increased health insurance and special education spending needs, most districts, not just those in the lowest-wealth quintile, spend below foundation on Regular Education Teachers. Only the highest-wealth quintile spends at foundation in this category. 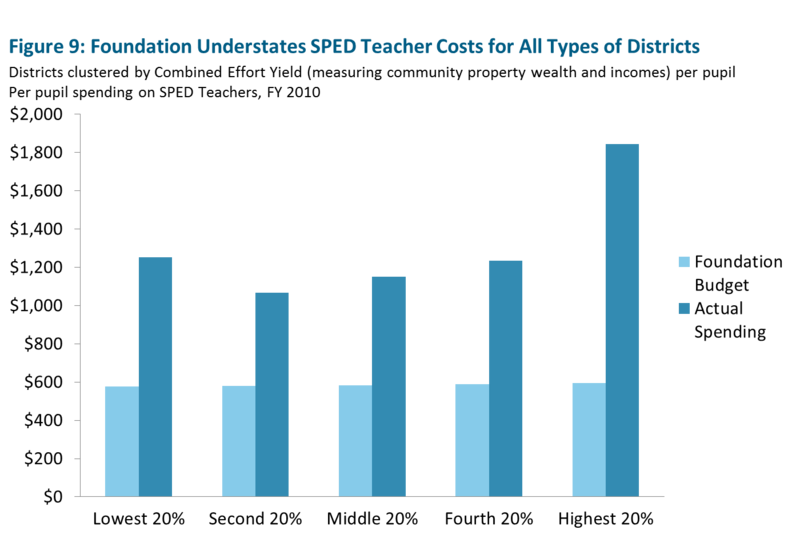 This distinction between under-spending on Regular Education Teachers and over-spending the foundation budget consideration on SPED Teachers is masked in analyses that combine these two types of teacher spending together. Furthermore, teacher salaries, adjusted for inflation, have remained remarkably level with the foundation budget's original salary assumption. This means that teacher spending below foundation levels has likely been manifest in the form of fewer teachers than foundation calls for, resulting in larger class sizes, less planning and meeting time for teachers during the school day, and the hiring of fewer specialist teachers, such as literacy specialists, language teachers, art teachers, etc. If you'd like to look more carefully at the breakdown of education spending across districts and wealth quintiles, visit our online interactive tool. MassBudget would like to thank the Massachusetts Association of School Business Officials for their financial support of this project. We also acknowledge staff at the Department of Elementary and Secondary Education for providing much of the data and resources that underlie our analysis. We would like to thank the following individuals for their advice and feedback during the research phase of this paper: John Crafton, Dave Danning, Roger Hatch, Ed Moscovitch, Dave Tobin, David Urion, and David Verdolino. Errors and omissions in this report are our responsibility alone. MASBO is a non-profit professional organization of school administrators whose responsibilities include the business affairs of public and non-public schools. They may be wholly, or partially, responsible for budgeting, school finance, accounting, purchasing and supply management, transportation, maintenance and operation, school plant planning and construction, school food service management, and any other major areas of school business administration. MASBO, Inc., is a corporation organized under Chapter 180 of the General Laws of the Commonwealth of Massachusetts and has been actively engaged in the promotion of the establishment of the highest standards of school business administrators since 1957. MassBudget produces policy research, analysis, and data-driven recommendations focused on improving the lives of low- and middle-income people, strengthening our state's economy, and enhancing the quality of life in Massachusetts. The analysis and data in this report were prepared by the Massachusetts Budget and Policy Center and should not be attributed to The Massachusetts Association of School Business Officials or any of the other organizations or individuals acknowledged above. The state requires that district-level general fund spending be equal to or greater than foundation budget amounts; grant fund revenue cannot be used to help satisfy this requirement. For this reason, general fund spending, essentially the sum of local contributions and expenditures from Chapter 70 state aid, is the spending measure we use for this paper's core comparisons to the foundation budget. Districts do receive additional revenue through other federal, state, and other grant sources, but these dollars have always been considered outside of the foundation budget calculation. The foundation budget was originally designed with full knowledge that these other funding programs existed. In fact, the Education Reform Act of 1993 created the foundation budget alongside an explicit plan to increase simultaneously state support for other educational grants, always considered supplemental to the foundation budget. One exception to the practice of considering grant programs separate from foundation budget comparisons was district use of State Fiscal Stabilization Fund (SFSF) money, which came to states as part of the federal stimulus effort. Since DESE distributed SFSF to districts directly through the Chapter 70 formula in order to keep total spending at foundation amounts, we do build SFSF spending into our comparisons of general fund spending to foundation budget allocations, where feasible. Title I is a federal grant program that targets additional money to support low-income students. Since Title I funds grants are intended to "supplement, not supplant non-Federal funds," states are explicitly prohibited from considering Title I funds when designing and implementing their education aid formulas (http://www2.ed.gov/policy/elsec/leg/esea02/pg2.html#sec1114 [Section 1114(a)(3)]). While certainly not insignificant, Title I funds are not of a sufficient magnitude whereby including them in our analysis would dramatically change our findings. The state's special education Circuit Breaker program was first funded in FY 2004 in order to reimburse a portion of extraordinary costs associated with SPED students requiring the most intensive services. Creation of the circuit breaker program reflected the Legislature's recognition of high costs above and beyond what was first considered when creating the foundation budget's SPED Out-of-District category. The vast majority of circuit breaker reimbursementsroughly 96 percentis spent on out-of-district tuitions. In FY 2010, $135.7 million worth of circuit breaker funding was used to reimburse districts' SPED Out-of-District tuition costs. Our analysis nets out circuit breaker reimbursements, so that our total actual spending amount only includes payments out of the general fund that do not get reimbursed. Including this reimbursed spending would raise actual spending on SPED Out-of-District tuitions by $135.7 million, thereby also increasing the gap above foundation by this amount. If one were to include circuit breaker spending in this analysis, however, it would only be fair to include circuit breaker revenue on the foundation budget side as well, since, in a sense, the foundation budget captures state consideration of costs and creation of the circuit breaker program reflects a similar recognition of costs. Federal IDEA entitlement grants also help support SPED programs in Massachusetts schools, and when IDEA grants were increased as part of federal stimulus efforts in FY 2010 and FY 2011 the state decreased funding of the circuit breaker program by similar amounts. Unlike the state's circuit breaker program, IDEA funds are received by districts as grants, not reimbursements. Adding IDEA funds into our analysis would serve to increase the gap between foundation and actual spending amounts even further. Several changes have been made to the foundation budget over the intervening years since FY 1993, but they have been made in a somewhat piecemeal manner. The largest package of changes to the foundation budget occurred in FY 2007, when eighteen education cost categories were consolidated and redesigned into eleven. The table below summarizes changes made to the foundation budget since FY 1993.